With the Justice League beyond the control of conventional authorities, the new relationship between Superman and Wonder Woman unsettling those in power, and shadowy forces gathering to form a Secret Society, Amanda Waller thinks the time is right for the U.S. government to form its very own Justice League of America. Steve Trevor doesn't agree with the idea or with many of Waller's choices but he agrees to assist and lead the team for his own reasons. Quick vignettes with each prospective team member reveals Trevor isn't the only one keeping secrets. It's hard not to compare this #1 to Geoff Johns's first issue of Justice League. 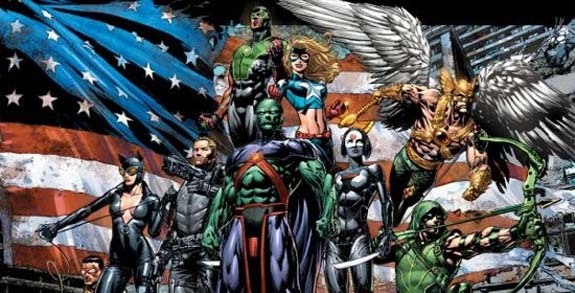 And while the team doesn't exactly come together by the end of the first issue, Johns markedly improves on the pacing this time around by introducing us to all of the characters and making a good case for why each of these strong willed loners would agree to joining a Justice League of America. The dialogue between Waller and Trevor tends to be exposition heavy at times, but more and more I tend to forgive that with DC books as being less the writer's fault and more DC editorial's refusal to use recap pages like Marvel does. Johns showcases a solid grasp on these characters and lays groundwork that leaves me excited for this title's future. The degree to which Johns missed writing Hawkman and Stargirl is palpable. The reveal as to the identity of Trevor's agent is surprising but the cliffhanger lacks weight given the character's rising profile elsewhere in the DCU. What really elevated this issue for me was the reasoning behind why each specific member was really chosen for this team, unveiled after the selections had been finalized. David Finch's art is much more in line with the darker, grittier nature of this title. His splash page of the Justice League looks almost out of place set against the more grounded settings and characters that populate this title. While facial work and expression still aren't Finch's strong suit, his figure work is decent and he packs a lot into an already oversized issue. I take some issue with a few of his character designs, specifically the cheesecakiness of Star Girl, and the insane heels Catwoman is sporting, but thus is super hero comics. Overall I would say this issue is one of Finch's strongest outings to date, however I have my concerns as to whether he can maintain this level of detail when the rigors of a monthly schedule set in. Overall this was a solid debut issue that was enjoyable if not particularly ground breaking or unique when set against the formula of team building issues. The real strength of Justice League of America #1 is the sheer seeds Johns plants here that are sure to pay off in interesting ways down the line. While I wasn't blown away by this issue, I'm very excited for the title's future.